A cabin owner in Milltown, Wis. was alerted to two cubs in distress last weekend when she heard some desperate cries in a wooded area nearby. When she arrived to the source of the sound, she noticed a little snout poking out from a hole in a tree trunk. Not knowing what kind of creature it was, or if it was truly stuck, she decided to come back and check the next day — and the following morning the snout was still there. She called authorities out to help and two wardens from the Wisconsin Department of Natural Resources were dispatched to the tree where they discovered that it contained a pair of bear cubs who appear to have crawled into the hole, but were unable to crawl out. “In 15 years of being a warden I haven’t seen a bears caught in a tree before. I’ve seen lots of bears just none that were trapped like that,” says warden Jesse Ashton to news station KARE 11. Unequipped to get the cubs out themselves, the wardens asked for the local fire department’s help. 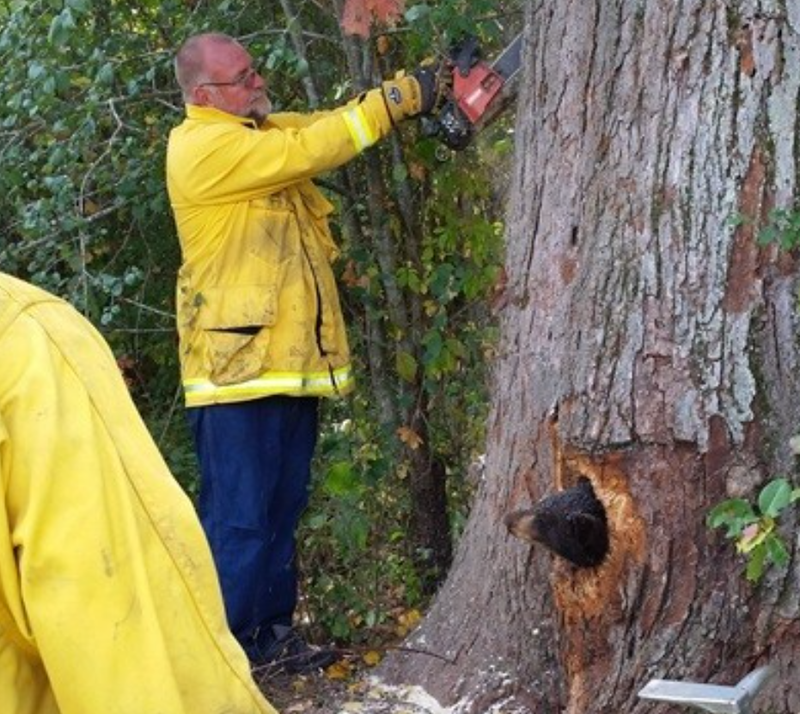 Using a chainsaw, firefighters carefully cut two wider openings into the hollow tree’s base, while one of the little bears watched on from his hole. A wildlife specialist who was on hand determined that aside from being dehydrated, the bears were in good condition. She offered them some watermelon to eat before letting them scamper back off into the woods. A representative from the Department of Natural Resources told The Dodo that the bears’ mother was likely still somewhere nearby. Wow, great story and lucky someone heard them and did something about it! Awwwwwwwww…I LOVE stories like this! Thanks so much for sharing it!! You’re so very welcome, Amber. Great story, such a win-win! Everyone happy!